From ghost to ghouls, and thrills to festivities, Lake County is home to some of the best autumnal offerings in the area. The top things to do this weekend October 12-14 are absolutely no exception. Lift your ‘spirits’ and have a scary good time in Lake County. Our autumn celebration is back and bigger than ever. For all other events and activities happening this weekend in Lake County, continue here. Grab the keys and buckle into your autumn-mobile and check out the top things to do this weekend October 12-14! Ghastly ghouls haunt the trails of Volo Bog this weekend at the quaking bog’s Ghost Stories Plus event. The state natural area boasts a slew of activities including tours of the haunted woods and bog, fall-themed refreshments like donuts, hot apple cider, popcorn and other treats for purchase and scary stories. To cap off the evening, award-winning storyteller, Megan Wells, will present a frightening tale to participants who escape the Ingleside natural area. The event is not appropriate for visitors under five years old. Reservations are required. Saturday, October 13; 5-9 p.m. Admission: $4-$6. Volo Bog State Natural Area, 28478 W. Brandenburg Rd., Ingleside. Hay, Hay! It’s a great weekend to visit Historic Downtown Long Grove for their annual DIY Scarecrow Day. Attendees at the beloved autumnal event will build a custom scarecrow that will be displayed throughout the historic village’s main street throughout October. The Historic Downtown Long Grove Business District will provide each participant with the basic structure for the scarecrows, bales of straw and building guidance. Attendees are encouraged to bring old clothing and accessories to decorate their creation. Saturday, October 13; 11 a.m.-4 p.m. $5 donation requested. Historic Downtown Long Grove next to the Country House, 430 Robert Parker Coffin Rd. It would be a ‘grave’ mistake to miss out on the Naval Station Great Lakes Cemetery Tour this weekend. The National Museum of the American Sailor invites military and civilian families to tour one of the Navy’s most private cemeteries. Visitors can view several influential gravesites including that of Joseph Wallace Gregg, the first recruit to graduate from Naval Station Great Lakes in 1911. The tour involves standing and walking for up to one and a half hours. Registration is required in advance. Visit history.navy.mil to RSVP. Saturday, October 13; 10 a.m. and 2 p.m. Free admission. National Museum of the American Sailor, Building 42, 2531 Sheridan Rd., Great Lakes. Race to the finish line as the world’s ”husk-iest” 5K occurs this Sunday. Richardson Adventure Farm hosts the Corn Maze 5K through the twists and turns of their 33-mile long labyrinth. Runners will navigate through more than 250 turns of maize, and traverse the Illinois bicentennial-themed maze. Participants will receive a long-sleeve event shirt, a medal and a discount to the farm after the race. Same-day registration is available. Prior to the 3.1-mile contest, the Spring Grove hosts a Kids 100 Meter Maze Dash for youngsters aged 10 and under. Sunday, October 14; 8:30 a.m. race start. Registration and packet pick-up: 7:05-8:45 a.m. Admission: $50. Richardson Adventure Farm & Corn Maze, 909 English Prairie Rd., Spring Grove. Slide just over the Illinois border this weekend for Wilmot Mountain’s Epic Fall Festival. The fall-day event kicks off with a 5K run at 10 a.m. before the family festivities. After the course has been cleared, hayrides are offered through the end of the evening. The event features numerous activities including pumpkin painting, bounce houses, sidewalk sales, Burton Riglet snowboarding demonstrations, a wine tasting, a scavenger hunt, live music from the Kyle Young Band and later in the evening, a showing of the 1993 movie “Hocus Pocus” and a bonfire on the mountain. Admission to the event is free, however tickets to the wine tasting and refreshments are sold separately. 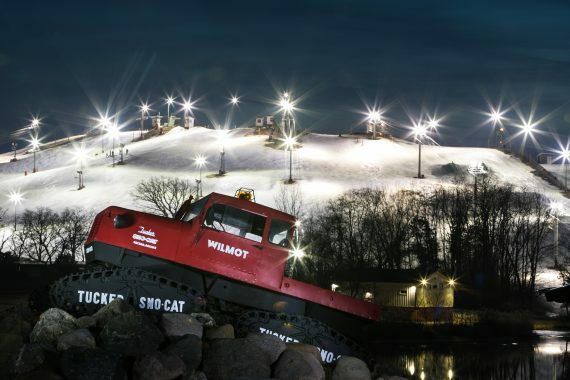 Visit wilmotmountain.com for more details. Saturday, October 13; 10 a.m.-8 p.m. Free admission. Wine Tasting: $20, cash only. Wilmot Mountain, 11931 Fox River Rd., Wilmot, WI. For all other things to do this weekend October 12-14, continue here.